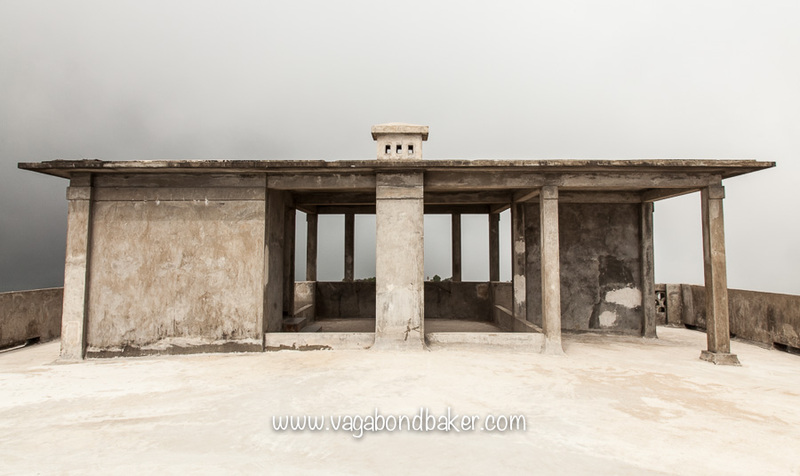 To escape the sultry humidity of Phnom Penh the colonial French found themselves a remote mountain near the coast, Bokor Hill. 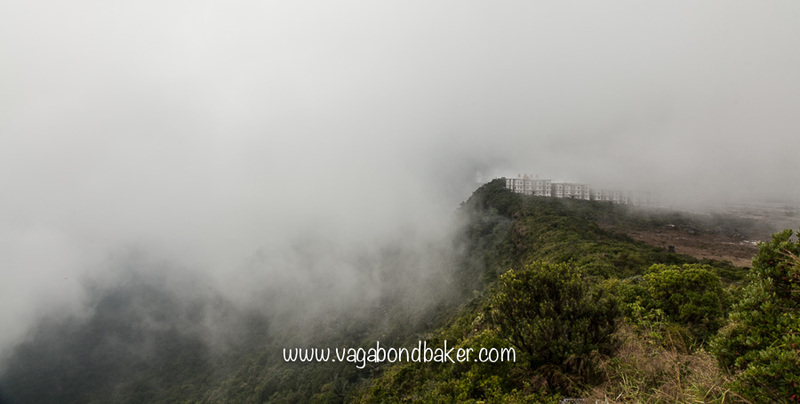 Up there the mist drifted in, cold and refreshing, a perfect place for a hill station. 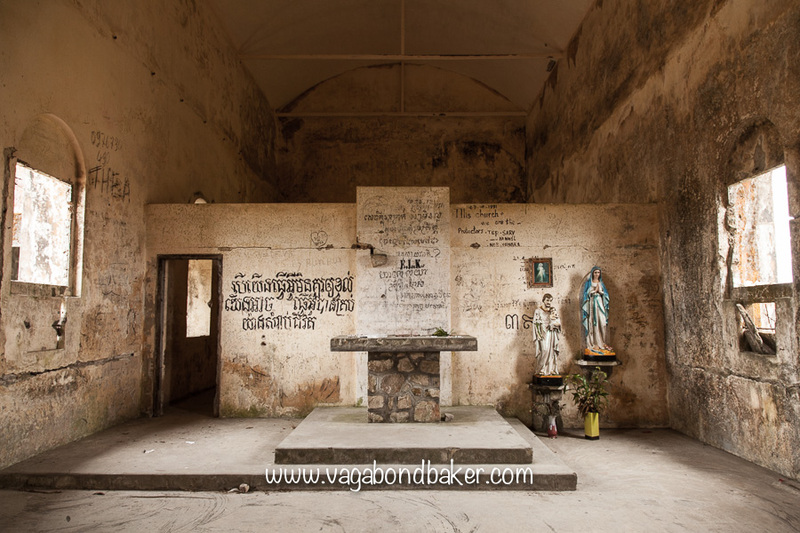 In the 1920s they built a small community up on Bokor Hill, including a Catholic church, a post office and a grand hotel, unfortunately at the cost of many lives, lost during the difficult construction. The hill station was abandoned by the French in the 1940s and was used as a strategic stronghold by the Khmer Rouge right up until the 1990s. The buildings remain, crumbling sinister reminders of Cambodia’s troubling history, concealed in eerie mists and isolated from the land below by dense primary rainforest. 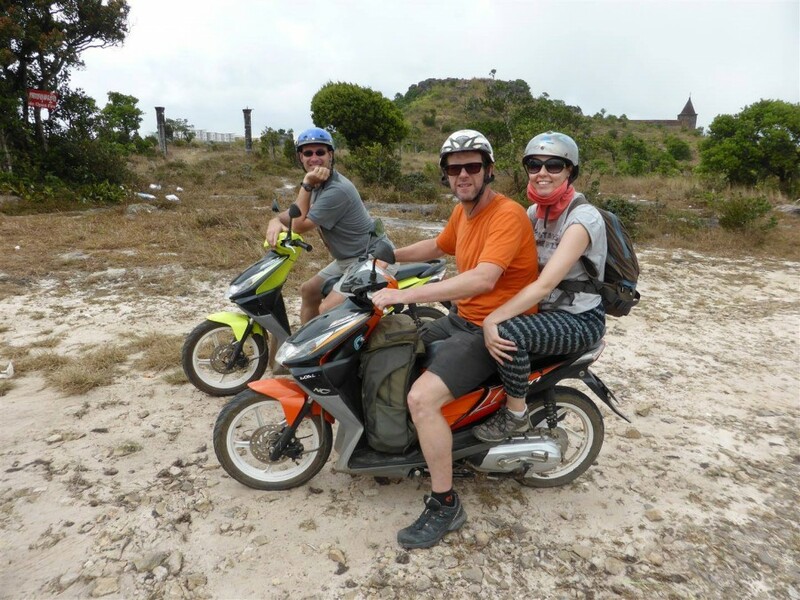 Chris, Jayne, Vaughan and I hired a couple of motorbikes from Kampot and rode up to the hill station on a newly tarmacked road, the ride was easy and quiet, and the views out to sea as we climbed were lovely. Our bike was a bit of a lemon though and lacked any kind of poke or power, something wasn’t firing and we crawled up the hill! Still, it was fun and great to feel the chilly breeze on our faces. 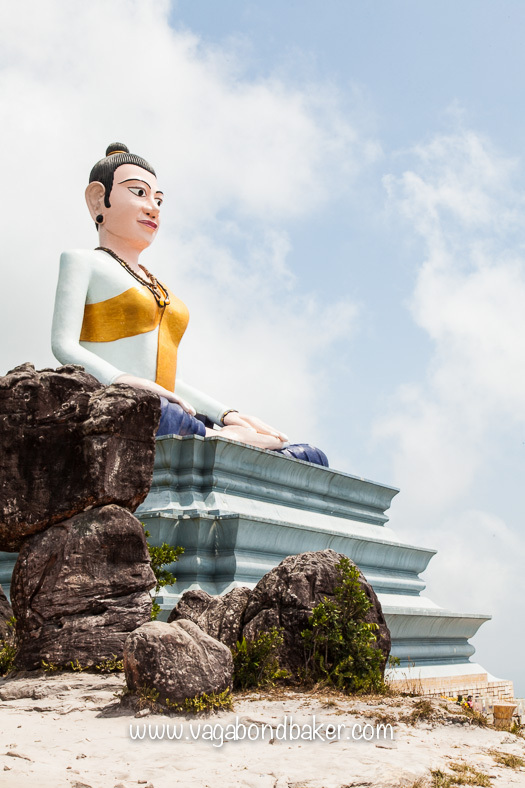 Our first stop on our road trip up Bokor Hill was the colourful Lok Yeay Mao Monument, a huge statue dedicated to Yeay Mao, a local female heroine, a new addition to the hillside. It was fortuitous we stopped as she is considered a protector of travellers, as well as fishermen and hunters. We continued up the hill passed the frankly hideous new casino buildings, a huddle of vulgar recent construction to draw tourists up the hill. Ugly as they may be however, the construction is the reason the road up here is now so good. Let’s hope the ambitious project doesn’t adversely affect the wildlife in the surrounding forests, rarities including the tiger, the asian elephant and various primates. The road continues on beyond the new construction, we rode up until a squat red tower pierced the mist. 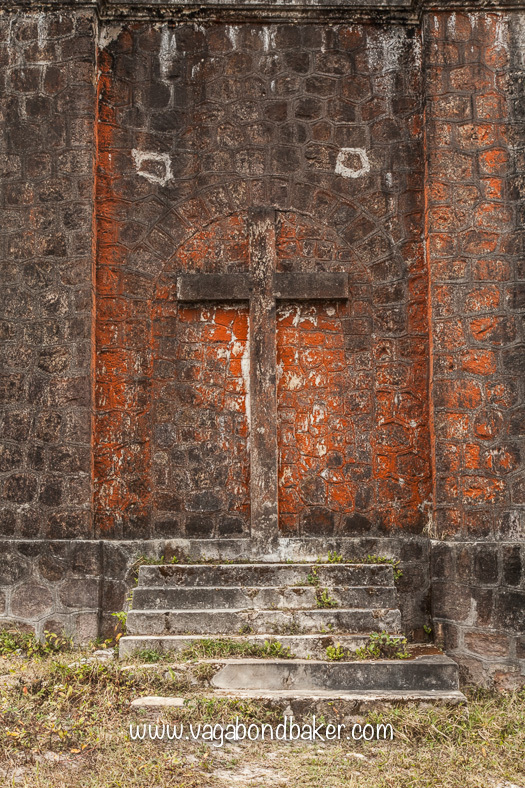 It was the ruins of the Catholic church, a red brick shell complete with a simple cross atop the steeple. 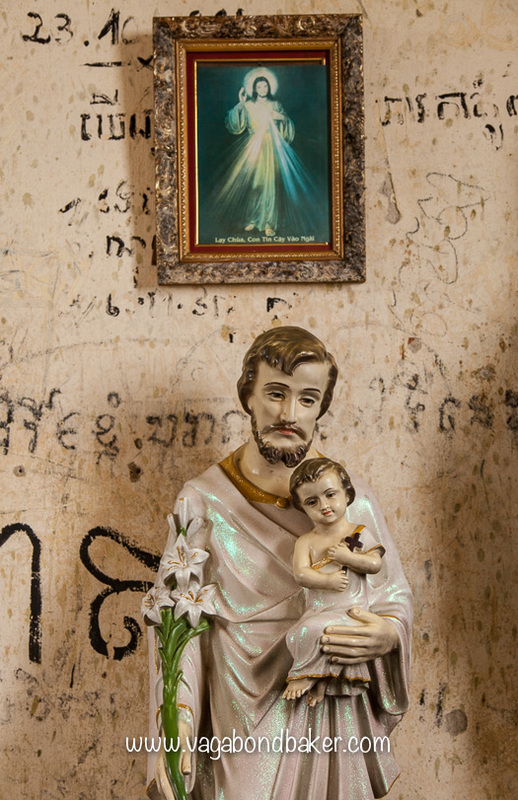 Inside, the church was bare and battle-scarred but there was still a haunting Christian presence, a bible, some votive candles laid out in a cross and some statues, looking bereft against the Khmer graffiti on the walls behind them. 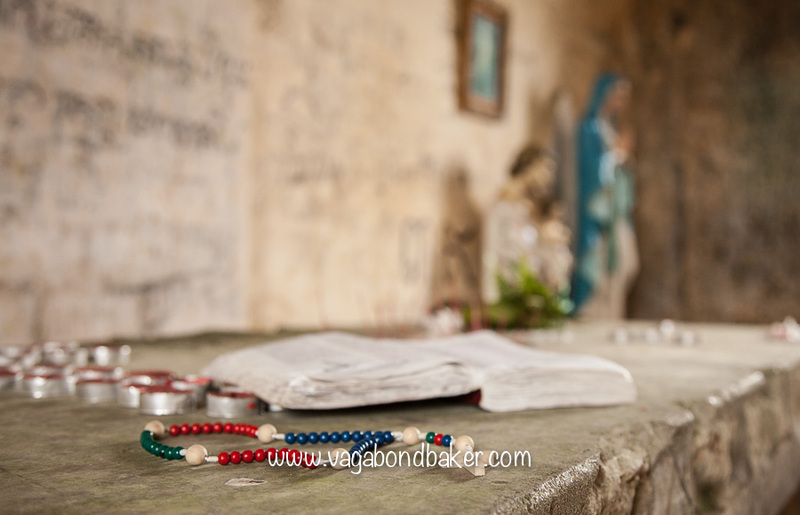 From the church the Bokor Palace Hotel stands bleak and grey across the hill-side. 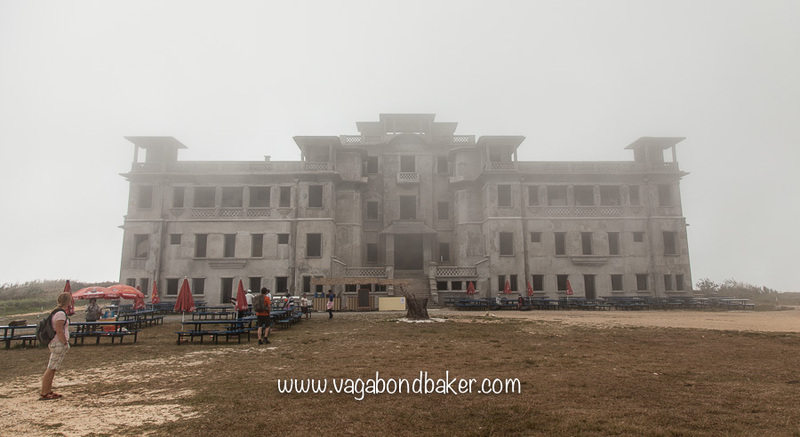 Le Bokor Palace opened its doors to Cambodia’s French elite in 1925, a grand hotel with grand views. Now the hotel stands empty, a rotting Art Deco pile from a lost era. It isn’t rotting though, the mould has been scraped away and the walls re-plastered. 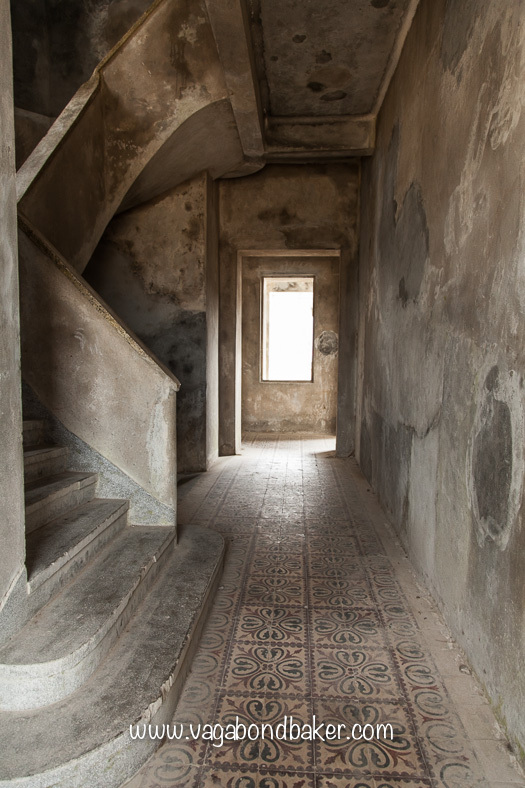 The hotel is currently being brought back to life yet the doorways are still, for the time being, open for the inquisitive visitor to explore the empty rooms and silent corridors. There were a number of tour bus groups wandering around the hotel when we were there yet it was easy to find ourselves alone such is the size of the property. Inside is a warren of corridors and stairways leading to the original bedrooms, their en suite bathrooms now just a tiled floor and some bare pipes. It didn’t take too much of a stretch to the imagination to conjure up how the hotel would have been in its heyday, I’ve watched enough episodes of Poirot to picture the glitz and glamour of the 1920s! 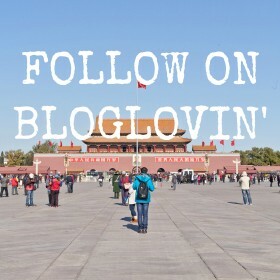 It really is a fabulous place to explore, to let your imagination run riot, and it will be interesting to see how the renovation is carried out. 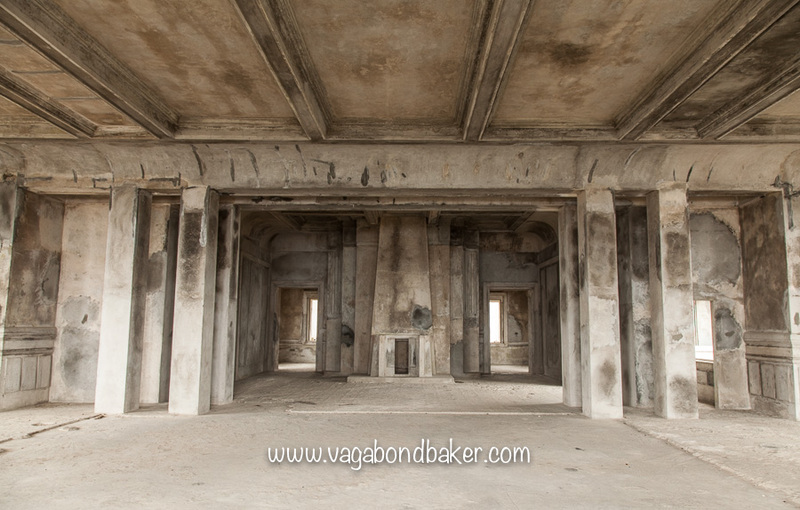 The ruins of the Black Palace, King Sihanouk‘s old residence, was closed off to the public, the road ended at the Bokor Hotel. The weather had turned decidedly chilly so we set off back down the hill, back to balmy Kampot. 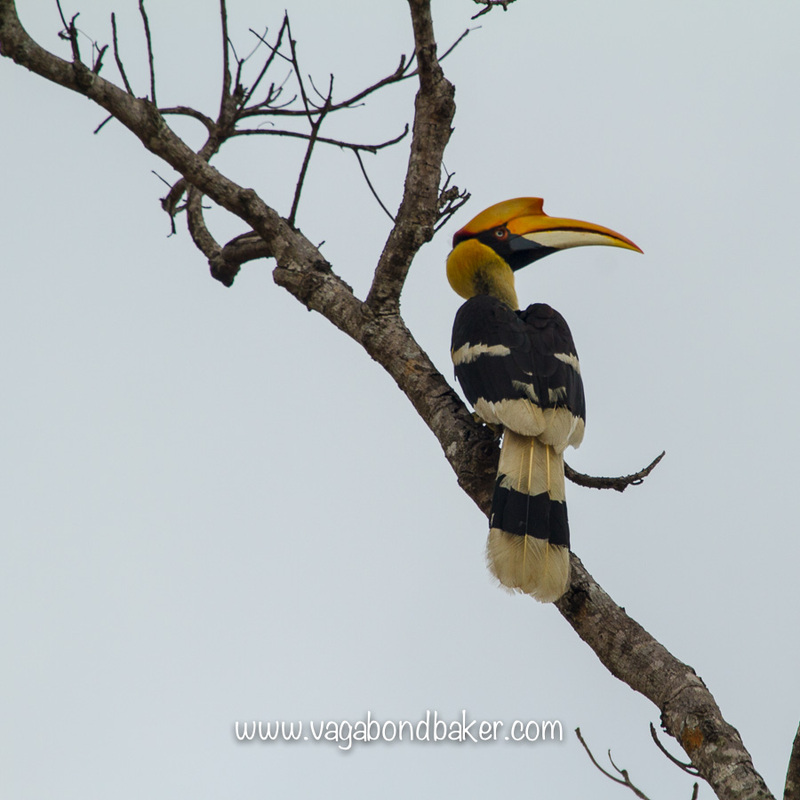 Heading down the winding road we spotted this magnificent Great Hornbill perched high in a tree, we stood and watched it until it flew off when a truck passed. The stunning hornbill was the perfect end to an adventurous day. We handed our motorbikes back, explaining that our little orange bike needed some TLC to get it running better before someone else rented it out! I think he got the message. 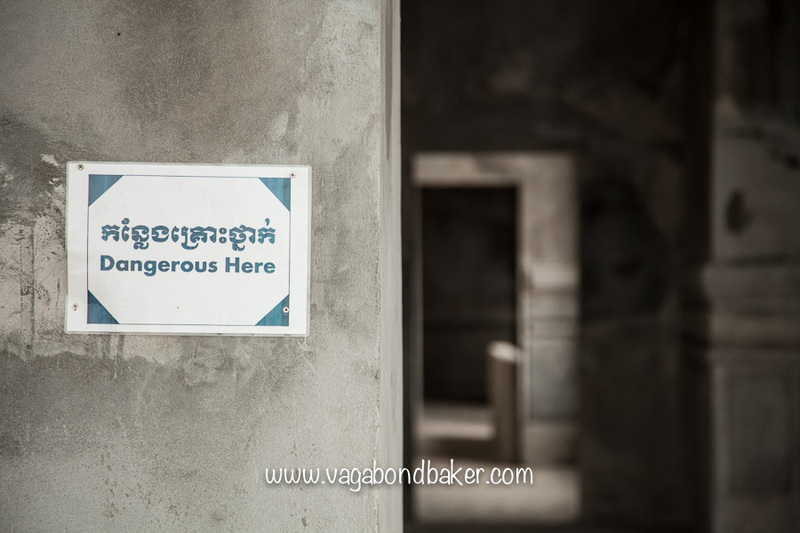 Bokor Hill can be done on a tour, lots of places in Kampot offer it, but it was fun to do it on bikes. Looking For The Irrawaddy Dolphin One of the rarest dolphins in the world on the Mekong River in Kratie. 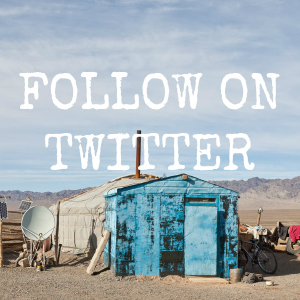 The Bamboo Train. Battambang and its Quirky Railway Whizzing down the line at 40 mph on a pallet! 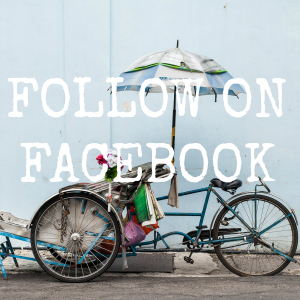 A Tuk Tuk Tour Around The Battambang Countryside Crocodiles, temples, Khmer Rouge horrors and millions of bats. Angkor Wat The most famous temple of all! Probably! How To Do The Temples Of Angkor a perfect 3 day itinerary to see the temples with tips! 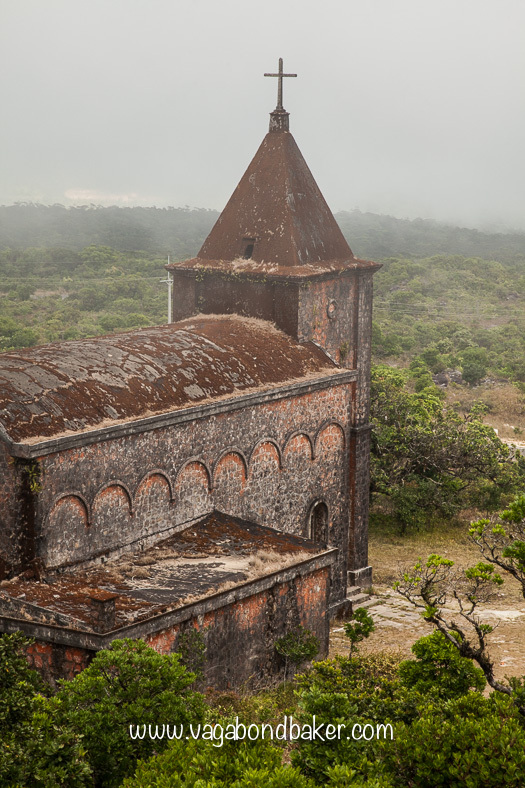 I love the pics of the old Catholic church in the mist, that must have been something to see! So strange seeing all the old French buildings in Cambodia. 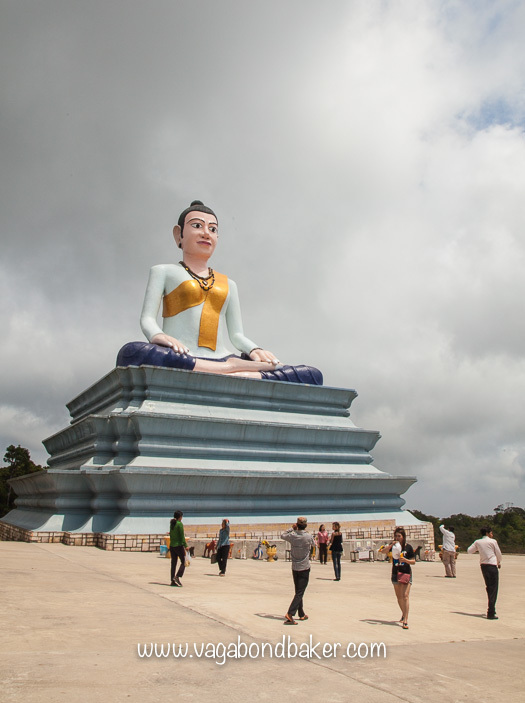 And that statue of Yeay Mao looks so new and shiny! 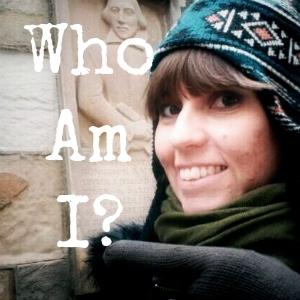 Do you know what she is famous for? How did she become a local heroine? Old colonial buildings have a strange, ethereal effect for me, often shameful history left such beautiful buildings. They completely shocked me in Burma, I wasn’t expecting so many to be honest. 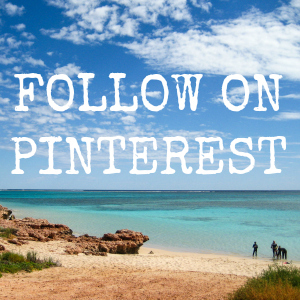 More on that in posts to come! Yeah Mao is a mythical heroine, she could be the beautiful wife of a warrior who led an army against the Thais after he died, but other stories also are told. She is only really found in the coastal south. I think it is, and I hope they keep it art deco but I doubt that! It was in a film with Matt Damon a few years ago, when it looked way more run down. There are lots of pics of it looking all mouldy and and ruined, it has already had quite a makeover!